The large fire broke out on Mt Roy just before 3pm and spread rapidly on the parched hillside overlooking Wanaka. Helicopters carried monsoon buckets between Lake Wanaka and Mt Roy to douse the flames. But police said the eight choppers battling the blaze had to be grounded for 15 minutes when the drone was spotted. 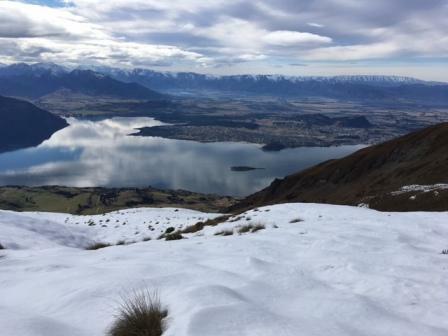 . .
Wanaka Area Response Manager Senior Sergeant Allan Grindell said flying a drone where helicopters were working was reckless and it was a timely reminder for drone operators to think before they flew. “Not only did the grounding of the helicopters cost money and valuable time in the efforts to extinguish the blaze, it put the safety and lives of the helicopter pilots at risk,” Sgt Grindell said. Stronger words than reckless could be applied to this. 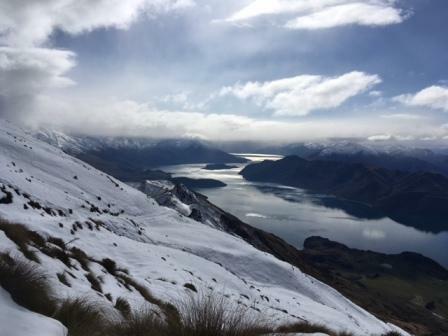 I spent the weekend in Wanaka and decided to make the most of two spare days by improving my fitness. On Saturday I went up Mt Roy (that’s what the locals call it but maps have it as Roy’s Peak). I was wearing walking shoes rather than tramping boots with decent grip and after about 45 minutes in snow and 20 or so minutes from the top decided that even with walking poles it was too slippery to continue. The view from there was still pretty good. Yesterday I walked to Glendhu Bay and back, a distance of nearly 30 kilometres which took about 6 1/2 hours. Today my legs are letting me know I’ve had a pretty good workout but the endorphins that come from it more than compensate and I’m grateful for that.